CTI is accepting online applications for 2019 seminars now through March 10. 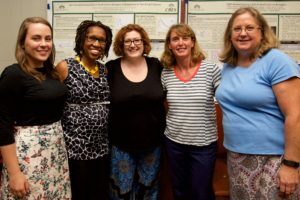 CTI offers eight content-rich seminars annually for CMS teachers, led by expert faculty members from UNC Charlotte and Johnson C. Smith University. CMS teachers (CTI Fellows) determine seminar topics and also collaborate with professors to develop the seminar curriculum. 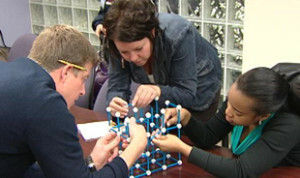 CTI promotes a collegial atmosphere in which teachers and faculty become professional resources for each other. While each seminar focuses on a specific subject, many seminars incorporate interdisciplinary ideas. Some seminar topics may also involve exploring the cultural and institutional riches of the Charlotte region. Seminars begin with preliminary meetings in the Spring, followed by independent reading and study during the Summer, and then meet weekly for two hours over the course of the Fall semester. The Institute supports its teacher Fellows throughout the process with an orientation, curriculum writing workshops, and individual conferences with seminar leaders. Teachers participating in CTI seminars have access to UNC Charlotte and Johnson C. Smith University campuses and their facilities, including libraries and museums. As a culmination to their seminar work, each CTI Fellow creates an original curriculum unit to apply what was learned during the seminar to her or his own classroom. Fellows share their units with other teachers in their schools, and all units are published on the CTI website. This collection of curriculum units created by CTI Fellows constitutes an online archive that has become a valuable resource for Fellows, their teacher colleagues and teachers around the world with internet access.